This year’s conference will be held Thursday, April 20, 2017 , at the Nationwide and Ohio Farm Bureau 4-H Center, in Columbus Ohio. We will have over 80 posters displayed from Students, Research Assistant/Associates and Post Docs. Guo-Liang Wang, from the department of Plant Pathology, will be the Steven A. 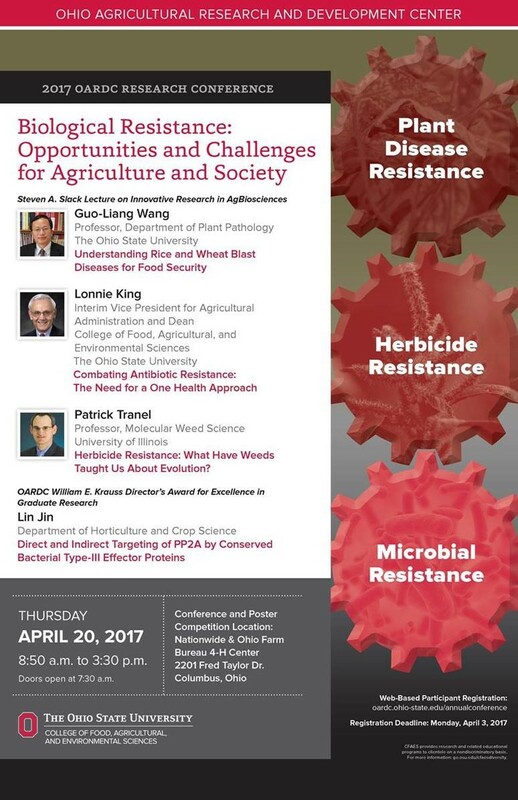 Slack Lecture of Innovative Research in AgBioscience speaker presenting, “Understanding Rice and Wheat Blast Diseases for Food Security”. Lonnie King, Acting Vice President for Agricultural Administrative and Dean of CFAES, presenting “Combatting Antibiotic Resistance: The Need for a one Health Approach”. We have reserved the OSU charter bus again this year for people that need transportation from Wooster to Columbus and ask that you take advantage of this resource by signing up for transportation during the registration process. No Motorpool cars will be available this day without prior approval. For a full agenda and to register for the conference go to: http://www.oardc.ohio-state.edu/annualconference. Registration is required.